safe journey, and turn thy dirigible homeward as soon as you can -- don't tarry! be sure to pack your mustache wax! brilliant! i'm so excited to find another aficianando. you are doing the good work. As a bona fide pogonophile (beard-admirer) I must take exception to your regrettable phobia about beards. Combined with the right mustache, a beard can be absolutely... um...irresistible. And I will never be able to grow a mustache of my own anyway, being of the female persuasion. I used to have a moustache. How grateful we are to have serendipitously discovered your wonderful weblog (sic). This is marvelous work, I must say. I have my own rather fine facial fur, that I hope you will one day examine in great detail. Wonderful photographs. Maybe one day you could do a blog on side burns. This is the most important blog on the internet. Bravo. I concur with sir dungan. Wish I saw this site sooner! I've done a David Niven (thin, cosmopolitain). Is there a name for that? Great read on so many levels, have linked you forthwith! Good to hear the gay ol' bachelors off on adventures to savage lands. Should be a smasher of a time. Remember us fondly to the locals and report on anything of consequence especially with regards to facial follicle fashion. My friend with winter close at had I also am rearing up quite a fine stash. Your lovely page has given me insight and inspiration thank you Sir. can i be given an e-mail alert when you begin researching great Major League Baseball Mustaches from the 70's and 80's? Jolly good; jolly jolly good! Seriously, I haven't read a blog this funny in awhile. Plus, I keep thinking about all the mustache ride jokes my husband has made over the years. Immature, but still the jokes are very amusing. You know when you log into blogspot and you can click on a featured blog of the day? Well, today I decided to do that and I fell upon your blog. I have found it to be quite nice! Keep up the good work, fellow blog-master. But I have, and one of long duration, gone from dark brown to grey in a lifetime. A pity you have not seen fit to display the modern era. Hmmph! I get it! I get it! See you on the anti-war marches and the picket-lines. And anyway, who needs a mother? It is good that someone of your stature and learning in this field has finally decided to share the knowledge. Alas there is not more of your kind. Never knew that facial hair could bring about so much mirth. A good one has to take a turn near the angle of the upper lip...! Good stuff. Enjoyed it very much! Dear J, You deal with an unique subject. I greet you from the Land of India where mushies are quite popular and some have made it into record books.Altho i am a woman I think some male faces improve face value when theu grow a mush.But they should be looked after properly. Shave them off I say! Greetings from tribe Kand-y Hool'ah! I have greatly admired your treatises on the various moustache forms of the nineteenth century. This century seems to have a regrettable decline in this noble hirsute pursuit. However, I find that you are guilty of shocking, and more importantly, sexist omission--you do not seem to have the proper appreciation for the female upper lip and the many tales it can tell! I hope you will look into the matter. Till then, hairy upper lip, and all that, eh? Chop chop! P.S. : Give my regards to Joseph. And you may NOT dock his pay for that! I've heard savages have fearsome moustaches, with teeth, the size of their bodies! Quite an intresting example... Good luck on your trip. I really wanna see a good VanDyke, or learn how to grow one! This is pretty much the most amazing thing I have seen in a very long time. I must say, you've got yourself a wonderful blog of moustaches. Kudos! I just happened upon your blog & I love it! mustaches: always interesting, always revolting. oh how i love to hate them! All I can say about nose dust-bins is YUCK but your blog is tres cute.. now get those things away from me!! I dare say, your mustacheary is magnificent. Just found this blog - it's great! Keep up the good work! doubtless you are aware of the impending joy to come in November? Wow what a cool blog! I really like it. It's so original. I didn't know it was possible to write a blog about mustaches. Funny stuff. Last year I did a thesis on the work of one Joseph Bazalgette, a nineteenth century London engineer, who was the possessor of one of the finest mustaches ever. Google him! Very intriguing site. You are obviously quite passionate about your interests. Sir, your mustaches both titillate and offend my natural feminine delicacy. As a fellow enthusiast of fine mustaches, I admire your work. 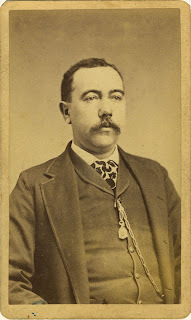 You, sir, are truly a pioneer in the all-too-important field of historical mustache research. I think a brief description of the etymology of the word 'mustache' should be mentioned. Apparently it came about when a gentleman was about to leave the warm embrace of his most beloved, and then head back to the wife, when his folk-dancing partner asked him if he was going to shave before he left. He replied by saying "No, I'm in a hurry, I must dash !" As he left, he muttered something about a bearded clam, but that's for another blog I believe. On your travels, you may, if fortune frowns on you or neglects your wellbeing, find yourself in regions antipodean. In the midst of your desperate attempts to reorientate yourself (Do moustaches grow upside down in the southern hemisphere, as well as being spelt differently? ), you may spend some time considering the legend of The Spooky Men. Whoa these are old photographs! what an interesting blog, I daresay!